saigon sisters is a vietnamese restaurant on w. lake street. my office loves to order food from there for lunch... and i can't complain. i absolutely love it. 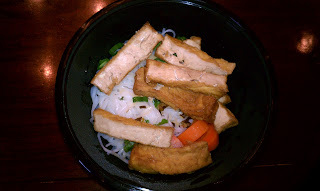 since then, i've had the vegetarian pho (several times) and the tofu spring rolls. and not surprisingly, most recently, i had the vegetarian pho again. vegetable broth, tofu, rice noodles, carrots, jalapeno & some other fresh herbs. this soup is delicious. a perfect, light lunch. 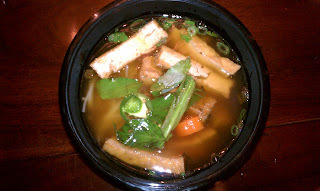 the flavor is nothing like any other veggie/tofu/asian soup i have ever had. it's incredibly flavorful. saigon sisters is a seriously vegan friendly joint. they've even got a section of their website/blog dedicated to vegan recipes! take a look here: saigon sisters vietnamese vegan. i'm dying to try out the crepes they've got posted. a must hit spot if you are in the west loop area and/or are craving some tasty pho. rise sushi & sake lounge. bloomington, indiana : yogi's grill & bar. bloomington, indiana : nick's english hut. bloomington, indiana : the village deli. upcoming posts : bloomington, indiana.